Are We Wogs Once More? Ethnicity has been defined accurately within the anthropological field as a ‘definition of differences’, superficial methods of establishing two camps within the public sphere, ‘us’ against ‘them’. Michael Moreman (1965) established this idea of entertaining cultural differences between two groups, claiming that the essence of ethnicity can only arise through an existence of separation. What then, is the driving force that creates these distinctions? Moreover, do people always wish to see a merge of their ethnic identities into one, or are they happier in having distinct cultural separations? This piece will examine European immigration into Australia and the changing patterns of ethnic understanding over the generations. I will mostly be focusing on the Croatian community, as I am a Croatian-Australian myself, but the thoughts and sentiments can be seen to be applicable to most European ethnic groups in Australia. To first grasp the generational differences on the understanding of one’s ethnicity, it would be wise to first outline a brief history of European immigration and their establishment of cultural hubs within Australia. Though European immigrants were let into Australia from the 1950’s, it was difficult for them to establish a common network of aid due to the initial hostility created by Anglo-Australians who were the predominant nationality at the time. Australia had only recently expanded their “White Australia” policy to allow people of Eastern and Southern European backgrounds to be allowed into the country, something which native citizens viewed as an encroachment of their cultural identity. Whilst every European immigrant may have been diverse in their culture or upbringing, they were all seen as ‘wogs’ in the eyes of native Australians. Being called a wog turned you into ‘the other’, someone against the moral code of the Australian culture. It was a derogatory word used to separate people along ethnic lines. Every new immigrant was a wog and it did not matter whether they were Greek or Italian or Macedonian; they were all the same in the eyes of Australians. So, what could these new people with such diverse backgrounds and cultural identities do to prevent a collectivism of their ideals, whilst also finding a way to assimilate within Australian society, through establishing a connection with the Anglo-Australians? The answer came through one of the few universals in the world. Football. Each ethnic group created their own football club within Sydney, which in turn created a barrier to protect their nuanced identity whilst also creating an avenue in which they could interact with Australian society and create a way to assimilate. One only needs to look at the logos used by each club to know which country they originated from. Sydney United was the hub for Croatians, Sydney Olympic was the home base for Greeks, Bonnyrigg Football was home for the Serbians, Rockdale City Suns were Macedonian, and so on. In the various clubhouses you would barely hear English; the music in Sydney United was always a mixture of Psihomodo Pop or Oliver Dragojević. Even the food served at the Sydney United home ground were mostly delicacies of Croatian cuisine, such as Ćevapi (beef mince rissoles in buns). The clubs were a microcosm of their original traditional culture within in the new land of Australia. The distinction was also shown on the pitch, players generally played for their national team. It was more likely you would play for Sydney United if you were Croatian. If you weren’t Croatian, you could not play for Sydney United. The football clubs also became the community centre of not only porting and social activity but also a hub for business networking and supporting members to assimilate through English classes. So, it held a balance for people who wished to assimilate as well as maintain their heritage. Whilst the initial reasoning and application of such a cultural hub made sense for the first-generation immigrants on Australian shores, what about the newer generations who entered the club decades after its inception? This is where my personal fieldwork comes into effect for this piece, as I will be using the 4 years I spent at Sydney United every weekend as ethnographic evidence to share my thoughts. I will admit that this piece will most definitely hold some inherent bias, especially as my father was the president of the club for that period. However, I also do believe that being of a younger generation changed my perception of this communal and cultural hub as a way to keep European communities connected to their heritage and history. The overall question I wish to ponder is whether these football clubs were successful in their original intent to preserve cultural identity whilst also assimilating within the new Australian context. I believe that initially the club (Sydney United) provided an avenue for assimilation of Croatian migrants within Australia, but now the modern variation of the club is completely different. It has swung in the opposite direction and is now an avenue for Croatians to reconnect with and maintain their ‘Croatian-ness’ or connection with the Croatian community, culture and heritage. This isn’t a detrimental thing, as I believe that cultural identity is important to the creation of one’s personal identity. However, evidence shows that the European football clubs today are not maintained to aid assimilation but instead to maintain a connection with one’s heritage or sense of loyalty to one’s country of origin, such as Croatia is for me. I believe this is because the newer generations of Croatian-Australians no longer need to assimilate as they are indeed more representative of the Australian culture than their parents and grandparents of Croatian culture. Thus, they seek to find ways to express and connect, to reconnect and reconstitute their Croatian ties and culture which they may not completely represent today through the ethnic hub that was once established for them. This can clearly be seen through the language spoken within the clubs. For instance, at the Sydney United Club, every weekend upon entering, one would expect to hear and speak Croatian. Whilst some members may revert to English when they could see another person struggling with understanding the language, older generations were more stalwart in their use of the Croatian language. What is more interesting is the complete lack of Croatian spoken outside of the club itself. When I entered the car with my father after a match, he would immediately return to using English and barely spoke Croatian. If a place was to aid assimilation one would assume that both languages would be used more equally within the club, but the supremacy of the Croatian language shows that the club was a place to assert and maintain one’s Croatian identity. Interestingly, the issues created and defended in various European countries translated to the behaviour of the members of ethnic communities in Australia. 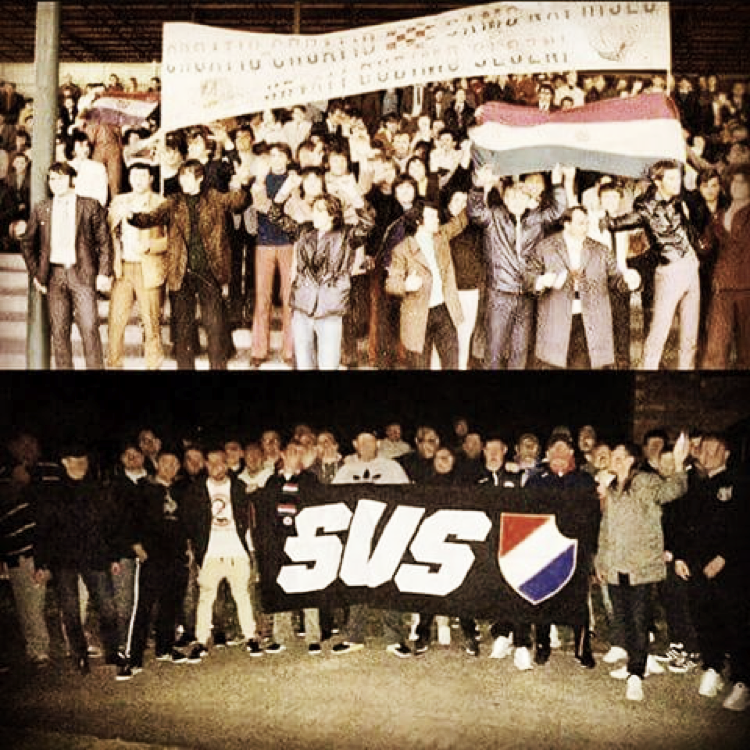 For instance, during the War in Croatia in the 1990s, both the Croatian team supporters through Sydney United and the Serbian team supporters through Bonnyrigg FC increased their hostility toward each other, especially during matches. Riots were frequent between both communities of supporters at games. It is strange to think that a decade after the war had ended violence had increased so much from these football supporters in Australia, for a conflict on another continent from which these members weren’t physically affected. There can be several reasons for the surge of culturally based hostility between these clubs, but I believe the largest contributor of this was an inherent sense of guilt felt by the newer generations of Australian citizens with strong cultural ties to their homeland. The people who perpetrated the hostility in Sydney United were members who were too young to have been able to fight in the war for independence, a war that was so crucial to the establishment of a free Croatia. The weak connection they might have had with Croatian identity was re-strengthened by the turmoil back in Europe and it was exacerbated through the fact that they could not be a part of that exact turmoil. This sentiment encompasses more than just the riots between football clubs in Sydney. It seems there is a continual need by some community members to prove their cultural and historical identity and origin. It may be that these people felt guilty for not being in a position to protect their homeland by sacrificing themselves for the cause of a free Croatia and thus expressed their Croatian-ness through their connection to football, the social connector. Newer generations seem to enjoy this divide of identity. They embrace the term ‘wog’ now as a term of endearment towards people who wish to be known as having deeper cultural richness beyond being simply Australian. I am proud to be a wog, it is fulfilling to have an ancestry to attach to and be anchored within, yet I am aware that this connection is maintained by having a secondary and significantly different cultural grounding in being Australian which I also hold dear. It seems we are wogs once more, though this time it is by choice. What's a White Yardie, Mum?